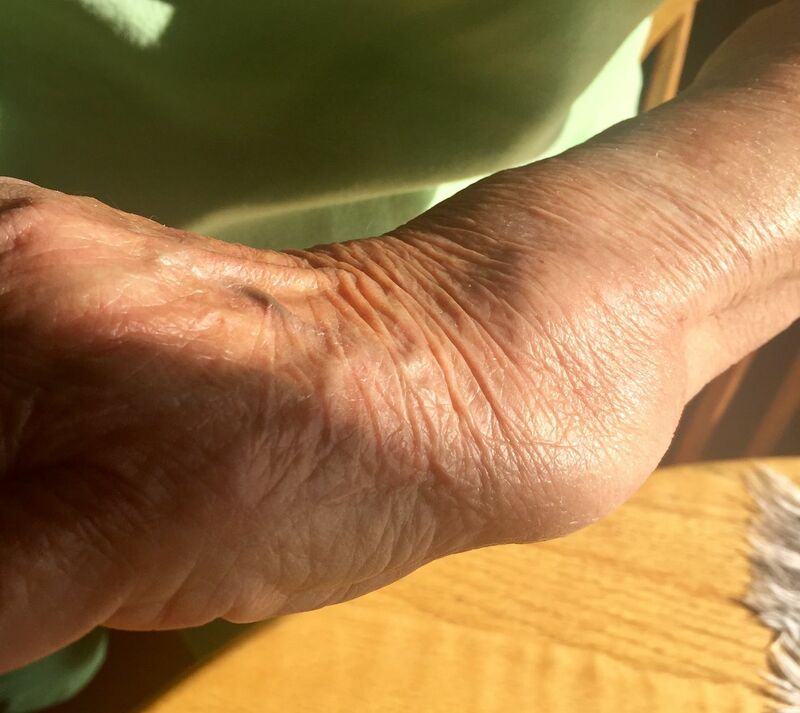 An 81-year-old Caucasian woman presented with left wrist pain and swelling, which first began approximately 3–4 years ago. As per patient, she saw her physician regarding this 1 year ago and was diagnosed with gout. Physical examination showed 4×3 cm left-sided volar ulnar wrist mass (figure 1). Patient’s picture showing swelling on the left wrist. The patient’s vital signs and rest of the examination were within normal limits. No history of trauma reported. Labs: serum creatinine 0.72 mg/dL, Vitamin D 25 was 20 ng/mL. Para thyroid hormone (PTH) was not ordered as calcium was normal (8.5 mg/dL). The patient did not report family history of TC so GALNT3 was not ordered. Connective tissue diseases were ruled out with negative rheumatoid factor (RF), anti nuclear antibody (ANA), cyclic Citrullinated peptide (CCP) and erythrocyte sedimentation rate (ESR). Single site ruled out calcinosis universalis and calcinosis circumscripta. Calcific tendonitis was not thought because of non-involvement of tendon. Synovial osteochondromatosis, synovial sarcoma, myositis ossificans, calcific myonecrosis and tophaceous gout were ruled out by imaging and histopathology. 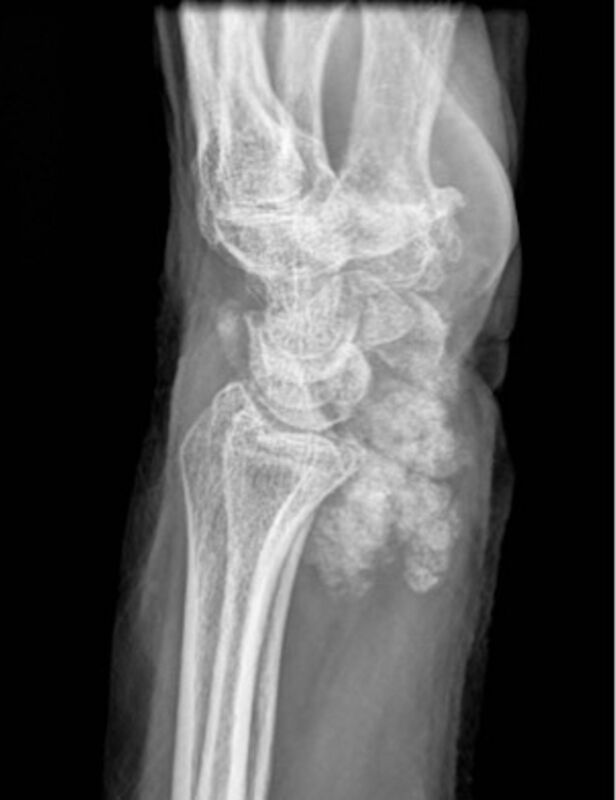 X-ray of the left wrist showed large cloud-like calcified periarticular mass in the ulnar aspect of the left wrist at the level of the ulnar head (figures 2 and 3). Based on X-rays, surgeons requested MRI. Axial and coronal T1-weighted images of the wrist demonstrated an inhomogeneous predominantly hypointense mass at the volar surface of the distal radioulnar joint with multiple foci of darker signal (figures 4 and 5). Corresponding coronal T2 fat-saturated image also showed a predominantly inhomogeneous hypointense mass containing multiple smaller foci of darker signal (figure 6). In gout, T2-weighted coronal MRI of the wrist demonstrates that the tophi are primarily hyperintense in signal, with some foci of intermediate signal also observed.1 After intravenous contrast, the mass demonstrated mild diffuse heterogeneous enhancement with several foci of non-enhancement (figures 7 and 8). Ultrasound-guided biopsy was positive for acellular amorphous crystalline material and accompanying blood clot, suggestive of TC on pathology (figure 9). 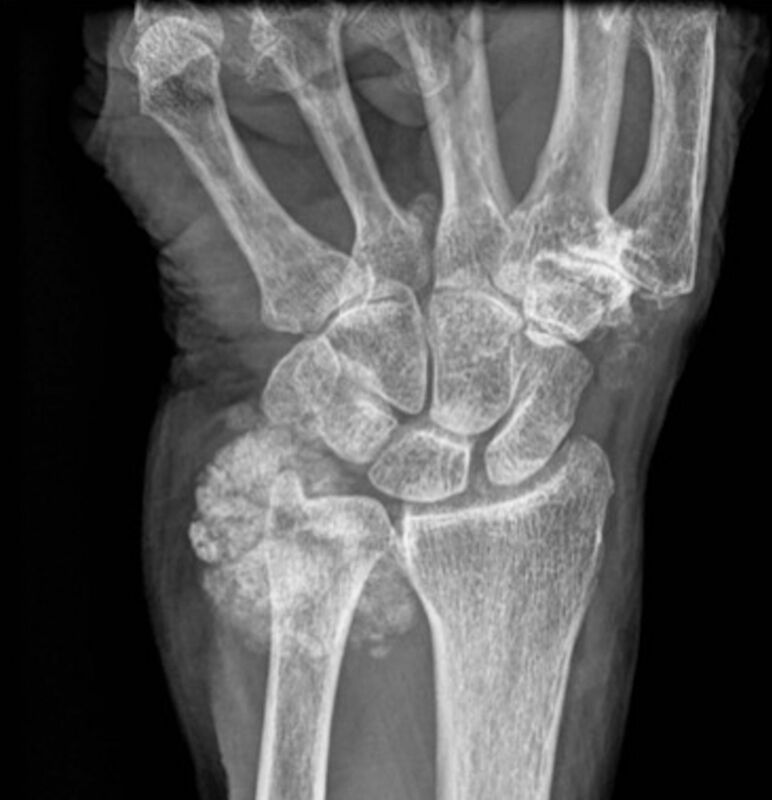 X-ray of left wrist showed large cloud-like calcified periarticular mass in the ulnar aspect of the left wrist at the level of the ulnar head characteristic of tumoral calcinosis. 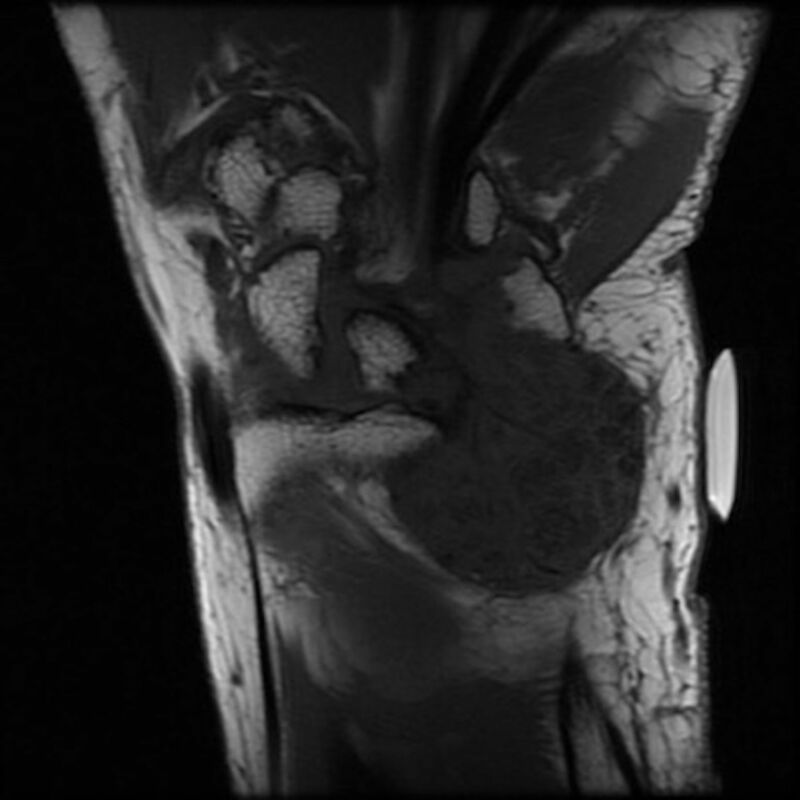 MRI showing axial T1-weighted images of the wrist demonstrating an inhomogeneous predominantly hypointense mass at the volar surface of the distal radio-ulnar joint with multiple foci of darker signal. MRI without contrast showing coronal T1-weighted images of the wrist demonstrating an inhomogeneous predominantly hypointense mass at the volar surface of the distal radioulnar joint with multiple foci of darker signal. 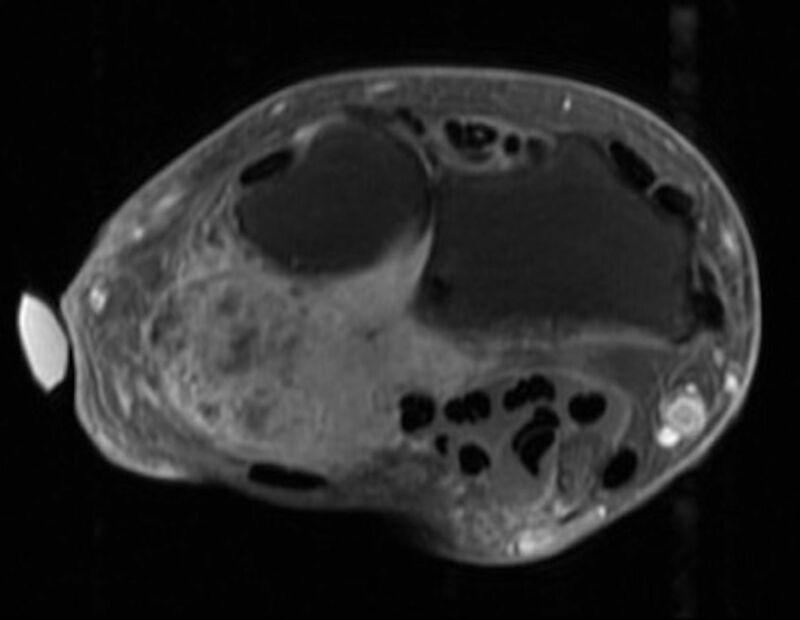 MRI left wrist with corresponding coronal T2 fat-saturated image also shows a predominantly inhomogeneous hypointense mass containing multiple smaller foci of darker signal. 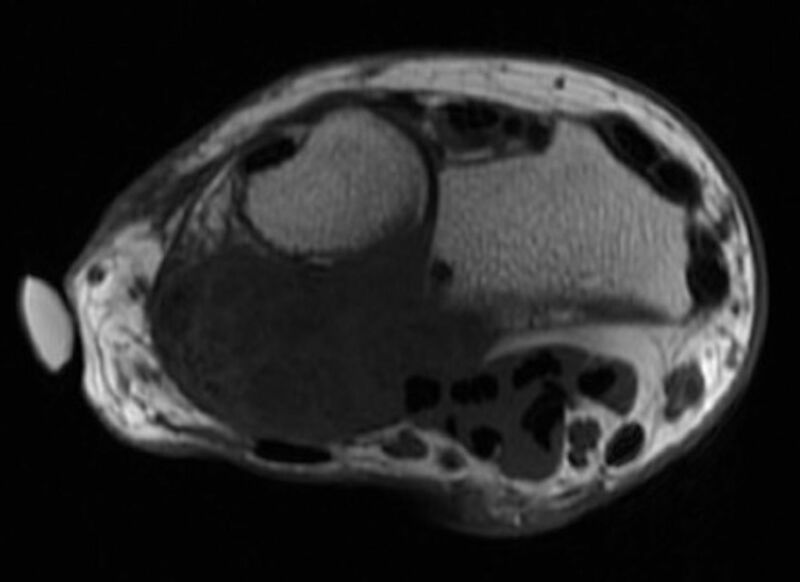 MRI left wrist axial section after intravenous contrast, the mass demonstrates mild diffuse heterogeneous enhancement with several foci of non-enhancement. 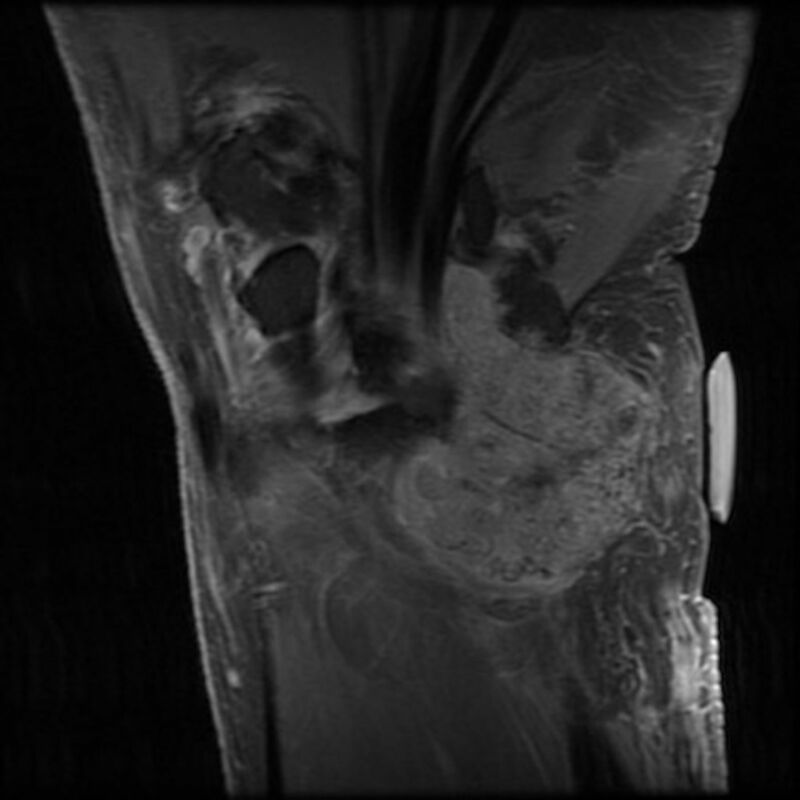 MRI left wrist coronal section after intravenous contrast, the mass demonstrates mild diffuse heterogeneous enhancement with several foci of non-enhancement. Ultrasound-guided biopsy was positive for acellular amorphous crystalline material and accompanying blood clot suggestive of tumoral calcinosis on pathology. Surgical options were considered but were not necessary other than for aesthetic reasons. On 1-year follow-up, no increase was seen in the swelling or pain. Tumoral calcinosis (TC) is an uncommon benign condition characterised by solitary or multiple painless, periarticular masses composed of calcium salts. The radiological appearance is characteristic, and radiologists have an important role in diagnosis. Before diagnosing the patient with TC, dystrophic and metabolic calcification should be ruled out. The disease continues to remain a diagnostic challenge and the role of radiologist is important to avoid unnecessary medical and surgical workup. Patients with small lesions can be monitored without any medical and surgical management. Before surgical intervention, medical management including phosphate depletion through dietary restriction should be tried in patients with TC. Contributors RH wrote the case and took patients and IRB’s permission to submit the case. ZA helped RH with the case. EGH read the images as a radiologist and helped with writing on the case. HS is the corresponding author and prepared the case for submission.